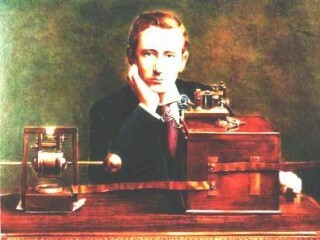 The Italian inventor Guglielmo Marconi designed and constructed the first wireless telegraph. For this work he received a Nobel Prize. The son of a wealthy Italian father and an Irish mother, Guglielmo Marconi was born April 25, 1874, in Bologna. He was educated by private tutors and attended the Livorno (Leghorn) technical institute for a short time. In 1894 Marconi began experiments on electromagnetics near Bologna. Leaving aside the fundamental nature of electromagnetic waves, he directed his attention to the distance over which they could be detected with the possibility in mind that they might be used in a telegraph. He repeated Heinrich Hertz's experiments and rapidly extended the range of detection. Moving out of doors in 1895, he introduced a transmitter sparking between an elevated aerial and earth. For detection he used a "coherer" (a glass tube containing metal filings which becomes, and remains, conducting when an electrical discharge passes through it but which loses its conductivity following mechanical shock), similarly connected between an aerial and earth. By the end of 1895 he was able to detect wireless signals at ranges greater than a mile and out of the line of sight. By interrupting the spark signal, he was able to transmit Morse code. Marconi patented his invention in 1896. Marconi was unable to interest the Italian government in wireless, so in 1896 he went to England, where he aroused official interest and received support from the British Post Office. Ranges attained by his instrument rose quickly, to 8 miles and then 25 miles and more. In 1899 signals across the English Channel, between Boulogne and Dover, caused a sensation, though the distance was less than that covered by other transmissions. In 1900 Marconi determined to try sending wireless signals across the Atlantic, despite the theoretical conflict between rectilinear propagation of Hertz radiation and the curvature of the earth. He had, however, already received signals at 250-mile range. Using the Poldhu transmitter, an established station in southwestern England, and a temporary aerial supported by a kite on Signal Hill, St. John's, Newfoundland, nearly 1,800 miles away, he received the first transatlantic wireless signals on Dec. 12, 1901. Also in 1901 Marconi patented his "four-circuit" tuning system. Thus multiplex wireless telegraphy became possible, and the interference of one signal with another was minimized. In 1902 Marconi patented a sensitive magnetic radiodetector to replace the coherer and, in 1905, the horizontal directional aerial, which at once brought improvements in signal strengths and allowed the development of long-distance commercial wireless. After 1905 Marconi spent much of his time as an entrepreneur, surrounded by a talented staff of engineers and administrators, developing wireless telegraphy. Attempts to introduce a transatlantic wireless press service in 1903 had been premature, but in 1907 commercial communication was established between Marconi stations at Clifden in western Ireland and Glace Bay, Nova Scotia. During World War I Marconi began experiments on shortwave radio and on aerials designed to transmit along narrow beams to minimize detection by an enemy. The year 1917 saw him as a member of the Italian mission to the United States on its entry into the war, and in 1919 he was a signatory to the Paris Treaty for Italy. He spent much of the next decade continuing the shortwave investigations begun in wartime, making useful discoveries, but none to compete with the great postwar expansion of the radio networks consequent on the development of radiotelephony and voice radio. He was hailed as the father of radio, but, especially in the United States, the real progress was made by a new generation. Marconi died on July 20, 1937, in Rome of a heart attack. He was a modest man of great scientific integrity, and his uncorroborated word was perhaps more readily accepted than that of any other inventor. He shared the 1909 Nobel Prize for physics with K. F. Braun. Marconi has attracted many biographers, though only two thorough works can be recommended. It should be noted that both were published in his lifetime and both received his imprimatur: B. L. Jacot de Boinod and D. M. B. Collier, Marconi: Master of Space (1935), and Orrin E. Dunlap, Jr., Marconi: The Man and His Wireless (1937).